While the temporary design wall was available, the Summer Picnic Dish was put up for a photo. At that point, no decision was yet made as to whether it would be a lap quilt or bed runner. A few more of the pieced arc/melon units are ready to be added and many more are cut out and waiting to be stitched. They are fun to stitch as it is one huge opportunity for loads of continuous stitching. Once the pieced arc is together, joining it to the melon takes only a few minutes. 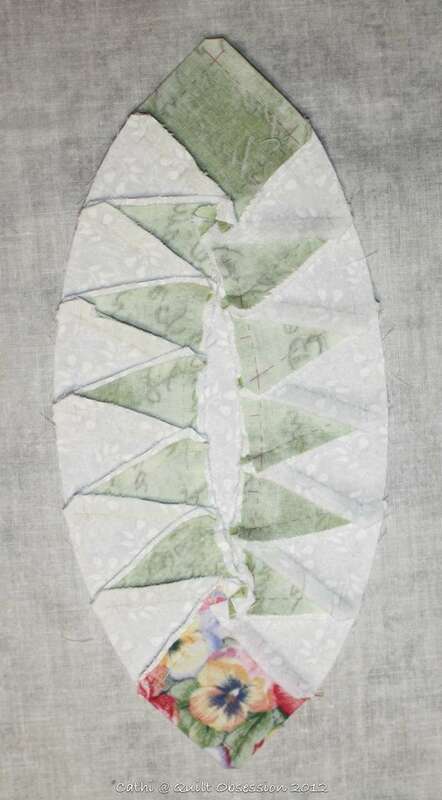 As I finish each pieced arc/melon unit I grade the seams and press the units. And now I’ve decided. This one is going to be a lap quilt. I think the exuberance of the floral needs to be a bigger quilt and it is one that we will use. 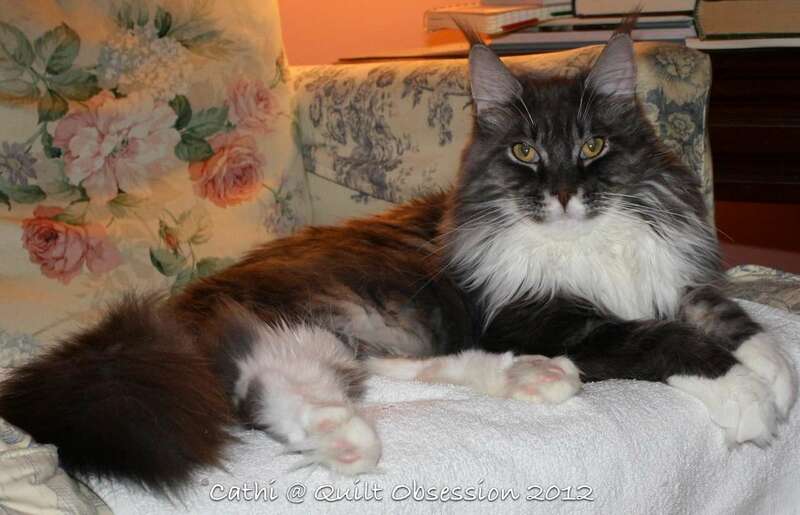 It would also look absolutely wonderful tossed over the pink loveseat in the living room. So now I’ll come up with a different idea for a bed runner. It will give me something to mull over as I work on the projects that are in varying stages of completion. I don’t think any words are necessary. The caption tells it all. Later on, Baxter was resting up on the couch. 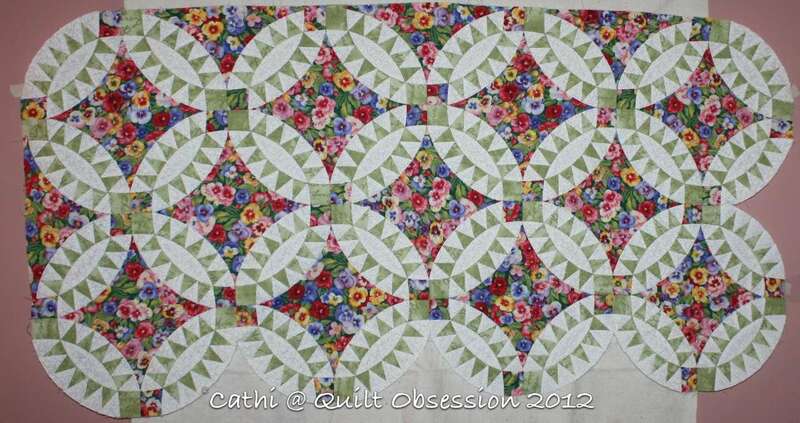 There is not one thing that I don’t LOVE about this quilt~ I think this is my favorite thus far Cathi. So pleasant and restful to look at. The fabrics are so pretty and perfect for this one. I hope Mr. Q.O. gets better soon. I can see he is in good hands. Catnip tea for him? It’s been pleasant here, in the 80s and a bit of rain. Feeling like Fall . I absolutely love this quilt!! The floral just adds so much to it… Glorious! Your quilt looks like a spring garden! Just as well that Mr Q.O. has Baxter to look after him, isn’t it? Love this quilt! The floral with the other looks lovely. Hope Mr. Q.O. Feels better soon! I continue to love the colors and the design of this quilt – beautiful! That is just beautiful! An incredible bed runner for sure! 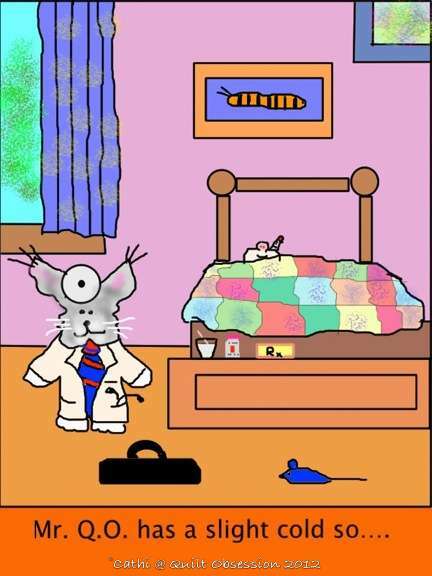 I don’t know about Baxter’s credentials, but I’m sure he’ll take care of Mr. Q.O. They are both so funny! I had a good giggle at the Baxtertoon! I hope Mr. Q.O. will be well soon. 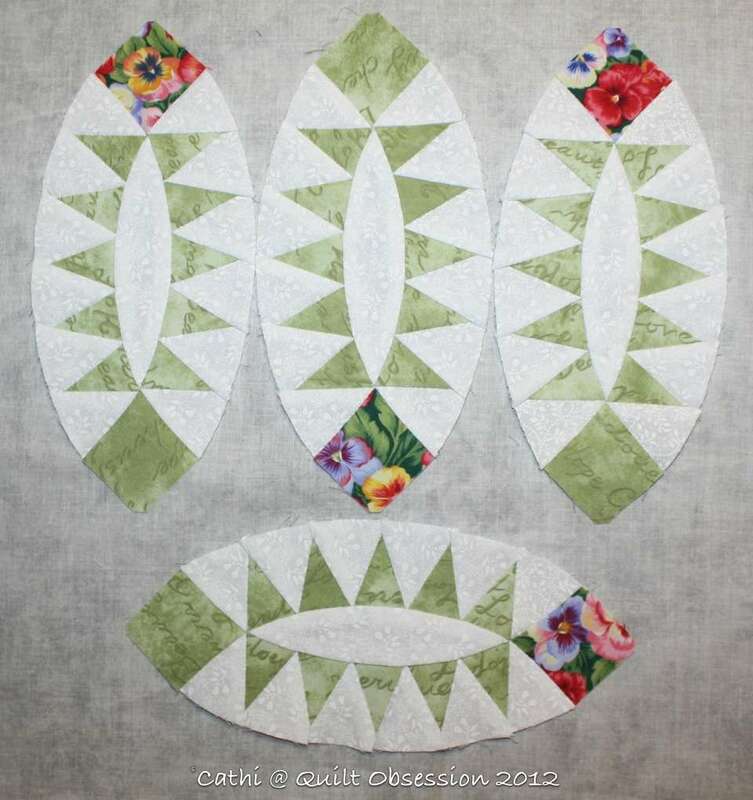 Love your Summer Picnic Dish quilt progress… Beautiful! Your post absolutely stopped me as I was scrolling through looking at quilts!!! IT IS GORGEOUS!!! thank you for sharing. Beautiful quilt project Cathi! I’m glad Baxter is there to care for Mr. Q.O.! May he recover quickly! Love the quilt. I hope Mr. Q.O. is doing better under Baxter’s expert care…..I love Baxter’s paws, so white with the pink pads. It’s gorgeous! I love how you let each project develop and tell you what size it needs to be and where it wants to live!